Thanks for speaking to me just now. As discussed, I’d like to request 2 B/W ink caricatures of the guys in the photos attached, with body and background. Below is a description of each guy, hope you can work your magic with this! • Yogi is a HUGE Naruto fan. 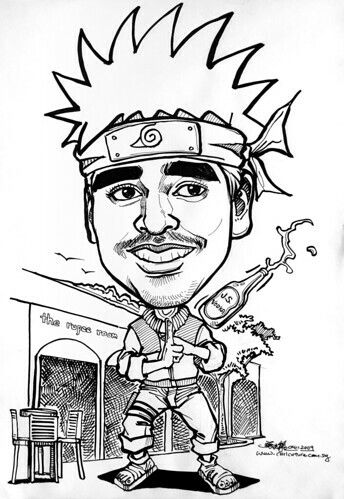 So the overall theme for the drawing should be Anime… Could you also make him look a little bit like Naruto (attached) with the costume and hair with headband? Not in the same fighting stance as the picture though. • He is a big fan of this club at Clarke Quay called Rupee Room. He should be standing outside the club entrance in the picture...."
Got a better detail Naruto's outfit from my son's comics, as he is also a Naruto's fan. When caricature is not done in colour, usually I will have to add in more lineworks to spice up the artwork, as in this case.